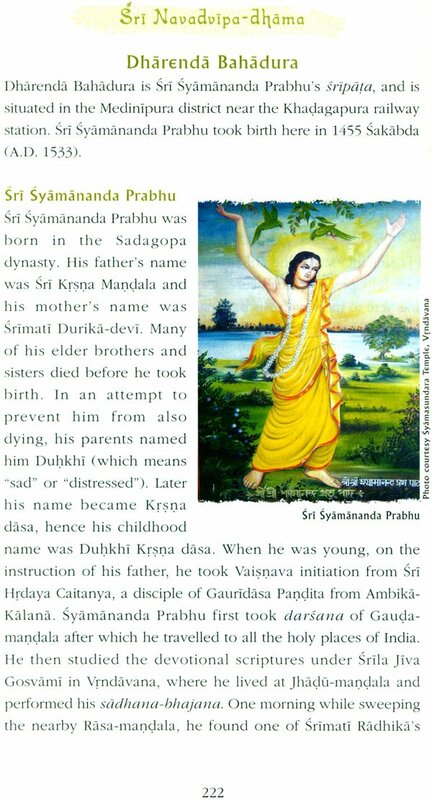 Syamasundara 'SrI Krsna, the son of the king of Vraja, is the ultimate limit of the Absolute Truth. He is the Supreme Personality of Godhead, the cause of all causes and the origin of everything, though He Himself is without origin. He is the personification of eternity, knowledge and bliss. He possesses all potencies and is the most merciful. He fully embodies and relishes all transcendental mellows. This same Sri Krsna, who performs pastimes filled with sweetness, displays the highest degree of magnanimity as SrI Gaurasundara, He who freely bestows transcendental love. Thus Sri Krsna and SrI Gaurasundara comprise an identical spiritual principle Ctattva). SrI Krsna's abode, SrI Vrndavana-dhama, is similarly identical in all respects to Sri Gaurasundara's abode, SrI Navadvipa-dhama.The perimeter of both is approximately thirty-two miles (sixteen kosas).' The Vedic scriptures reveal that Sri Gaurasundara's pastimes are the sequel to Krsna's pastimes. In Vraja, SrI Krsna relishes the mellows of transcendental love, and in SrI Navadvipa-dhama He distributes them. 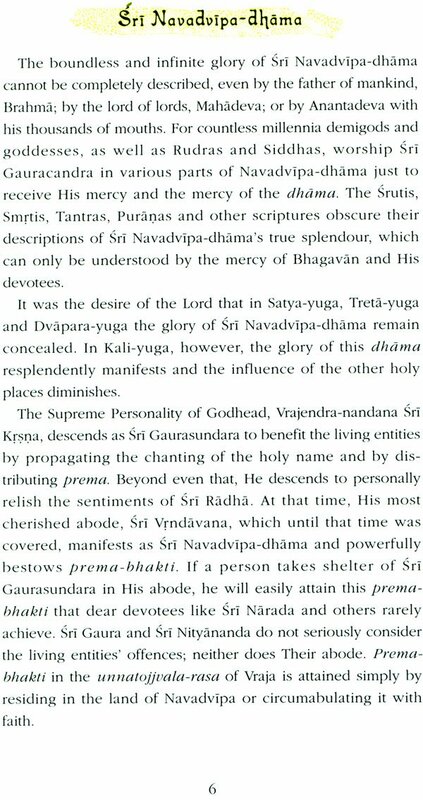 That devotee who performs his devotional practices aspiring for the transcendental mellows of Vraja can easily attain this vraja-prema by taking exclusive shelter of SrI Gaurasundara and His dear associates in Sri Navadvipa-dhama, where offences are not considered. Hence, the glories of both Navadvipa-dhama and vrndavana-dhama defy description. 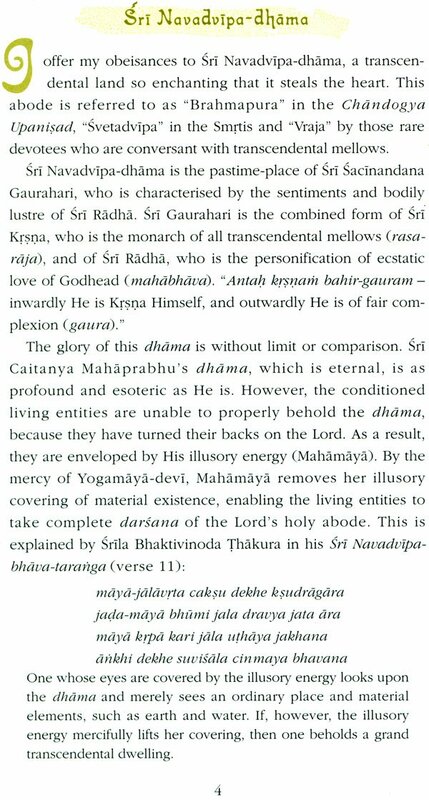 Devarsi Narada, Sri Uddhava and other exalted saints possess a high calibre of prema, but still they aspire to acquire this rarely attained uraja- prema. Sri Gaurasundara's abode easily bestows this prema to Sadhakas who take its shelter. In conclusion, SrI Navadvipa- dhama is as supremely magnanimous as SrI Gaurasundara Himself. 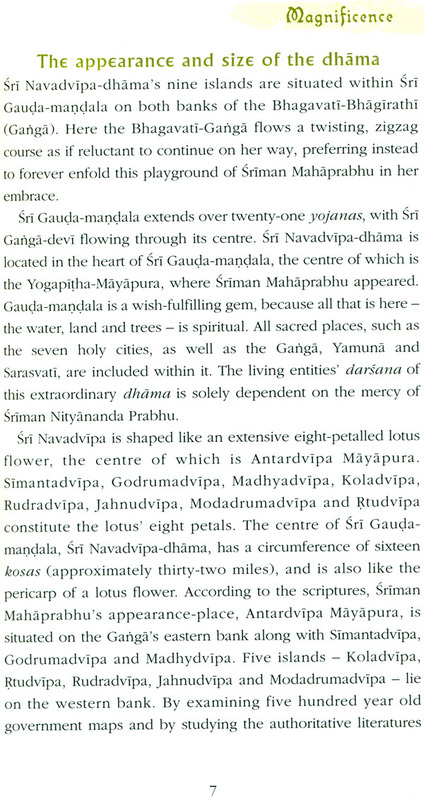 Navadvipa-dhama consists of nine islands [nava means "nine" and dvipa means "island"], namely, Antardvipa, Simantadvipa, Godrumadvipa, Madhyadvipa, Koladvipa, Rtudvipa, jahnudvipa, Modadrumadvipa and Rudradvipa. Furthermore, SrI Navadvlpa- dhama is the abode of the nine types of devotional service as follows: Antardvipa - self-surrender; Simantadvlpa - hearing; GodrumadvIpa - chanting; MadhyadvIpa - remembering; KoladvIpa - serving the Lord's lotus feet; Rtudvipa - worship-ping; JahnudvIpa - offering prayers; ModadrumadvIpa - engaging as a servant; and Rudradvipa - serving as a friend. 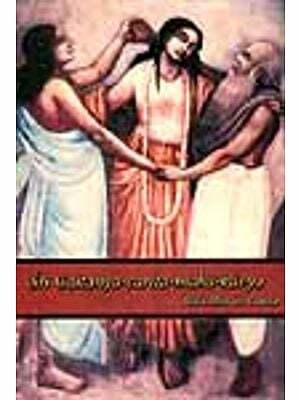 SrI Gaurasundara and His intimate associates enacted their pastimes throughout Navadvipa-dhama. 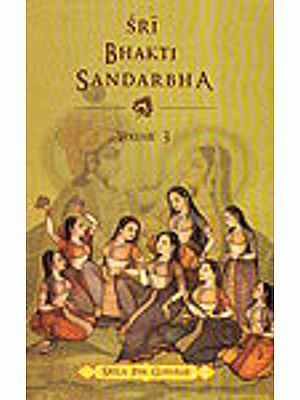 Gaurasundara also performed pastimes in SrI Gauda-mandala, the area surrounding and including Navadvipa-dhama, where many of His associates appeared, performed their pastimes and practised their bhajana. 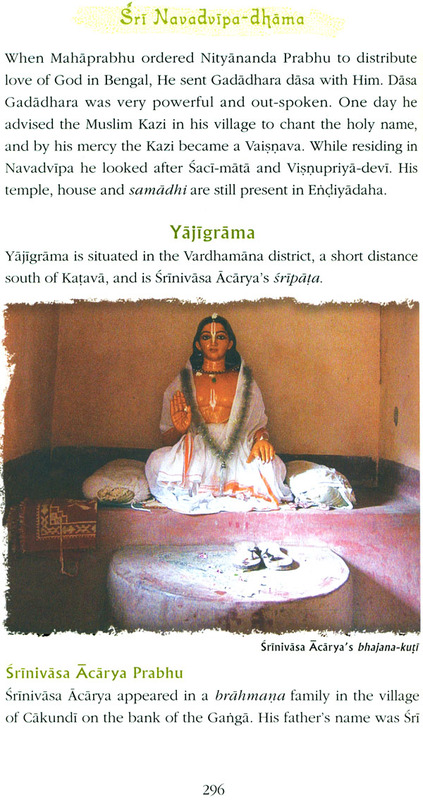 To this day the places mentioned in this book serve to generate memories of the Lord's pastimes. Even today Sri Gaurasundara performs pastimes here with His associates, but only an exceedingly fortunate living entity can behold them. The jiva's life becomes successful by circumambulating SrI Navadvipa-dhama, where the Lord's most munificent pastimes are enacted. Moreover, if he does so while chanting the holy name and hearing hari- katha, he receives unlimited benefit. 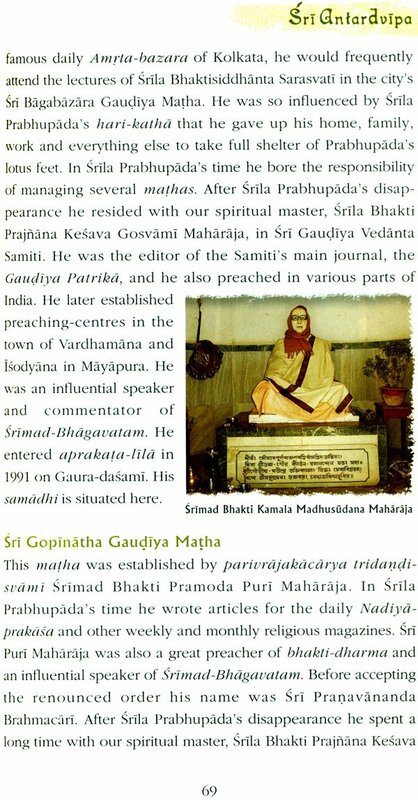 Srila jiva Gosvami was still a youth when Mahaprabhu (Sri Gaurasundara) entered His unmanifest pastimes. Soon after, he renounced material life and came to Sridhama Mayapura. 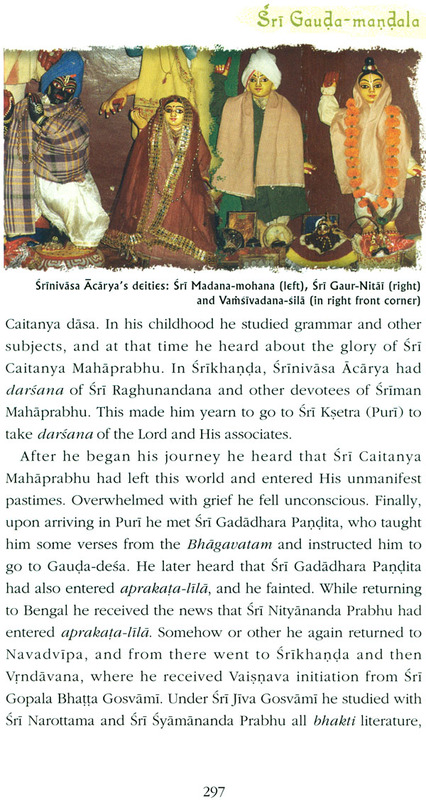 In the house of Mahaprabhu, Sri JIva Gosvami received the priceless mercy of Sri Nityananda Prabhu, who later guided him on Navadvipa-dhama's thirty-two mile parikrama, elaborating on Sriman Mahaprabhu's pastimes in each and every place. Srila Bhaktivinoda Thakura's deeply moving descriptions of this parikrama are recorded in Sri Navadvipa-dhama- mahatmya (see Parikrama-khanda). 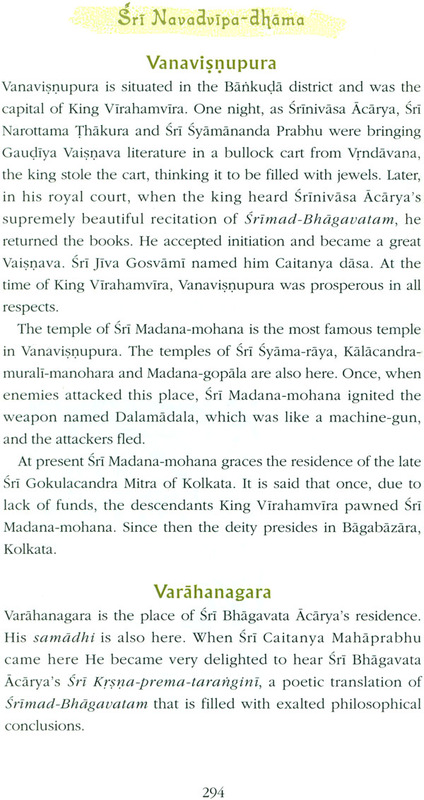 Years later, ' Sri Isana Thakura, an associate of Sriman Mahaprabhu, took Srinivasa Acarya, SrI Narottama Thakura and Sri Ramacandra Kaviraja on parikrama of SrI Navadvipa-dhama. Srlla Narahari Cakravarti Thakura gives a captivating description of this parikrama in his Bhakti-ratnakara, and a concise yet heart- rending description is found in Srila Bhaktivinoda Thakura's Sri Nauvadvipa-bhava-taranga. 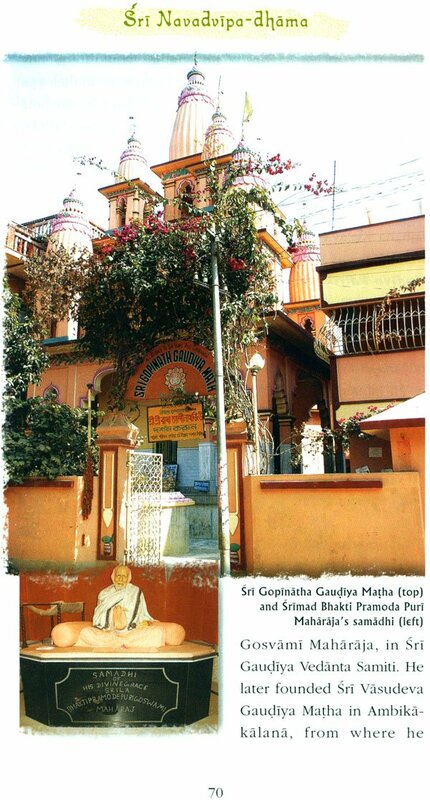 In recent times our grand-spiritual master, om Visnupada astottara-sata Sri Srlmad Bhaktisiddhanta Sarasvati Gosvami Thakura Prabhupada, inaugurated Sri Navadvipa-dhama parikrama and executed it according to the section on parikrama in Srila Bhaktivinoda Thakura's book Sri Navadvipa-dhama-mahatmya. He performed the parikrama with thousands of pilgrims to bestow this auspicious opportunity upon the wider community. Following in his footsteps, our spiritual master, jagad-guru nitya-lila pravista om visnupada astottara-sata SrI Srimad Bhakti Prajnana Kesava Gosvami Maharaja, per-formed this parikrama annually, as do those devotees who have taken shelter of him. 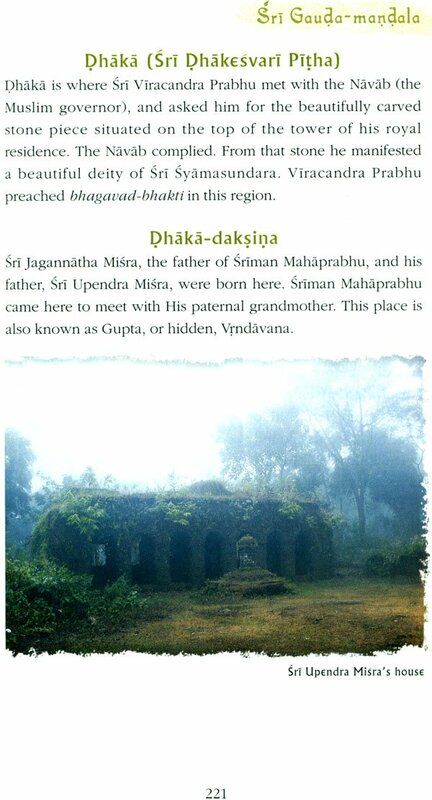 In this book our eternally merciful Gurudeva, SrI Srimad Bhaktivedanta Narayana Maharaja, describes the numerous sacred places of SrI Navadvipa-dhama and introduces many of the holy places in the surrounding area of SrI Gauda-mandala (which includes Bangladesh). 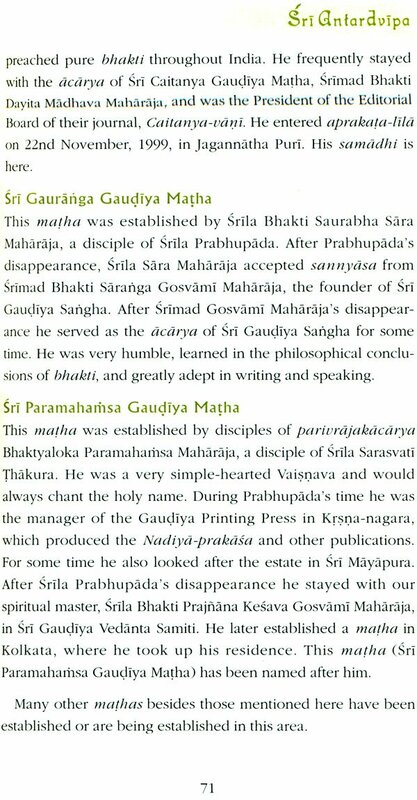 The enclosed map of SrI Gauda-mandala offers another dimension of involvement to the reader of this and other books about Sriman Mahaprabhu and His followers. The locations of many places were verifiable, but over time, some places have been forgotten or obscured by changes in landscape, and therefore were not easily located or available for darsana. Sripad Bodhayan Maharaja kindly connected us with Sriman Mukunda Prabhu (Mr. Mukulpada Mitra) from Dhaka, who ensured a successful pilgrimage to Bangladesh to take photos. 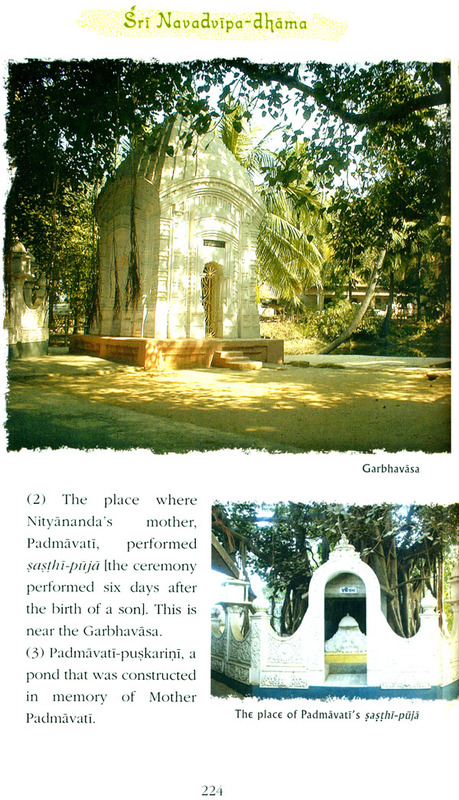 Both ISKCO temples and Gaudiya Mathas showed their non- sectarian spirit by giving assistance in this regard. 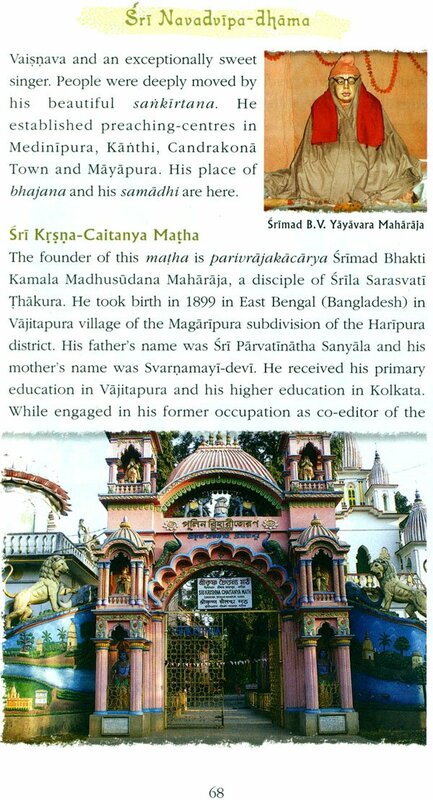 We are ever indebted to Srlla A.C. Bhaktivedanta Svami Prabhupada, who revealed to the Western world the glories, pastimes and abodes of SrI Gauranga Mahaprabhu and His associates. We pray to one day genuinely desire the mercy of our Gurudeva and the followers of Mahaprabhu, by which we will all find ourselves submerged in the same ocean of love for SrI Gauranga in which they are blissfully immersed.